Trees down on Jan. 3, 2016. Photo courtesty Sandy Gonzalez. 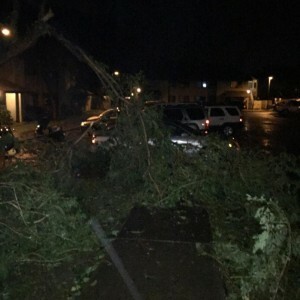 High storm winds brought down trees and debris in electrical lines last night, keeping Maui Electric crews busy as they continue to respond to numerous outages on Maui and Moloka‘i this morning, MECO reported at 6:30 a.m. on Saturday, Jan. 3. Currently, crews are working in multiple areas to restore power to about 19,588 customers in parts of Central Maui, South Maui, Upcountry, Pā‘ia, Ha‘ikū, East Maui and Moloka‘i. In Central Maui, crews are working to bring back a major transmission line and restore power to about 5,070 customers in Kahului and Wailuku. Crews are also responding to outages in South Maui, where approximately, 6,000 customers are currently without power in North Kīhei and Wailea. Crews are also working to restore power to parts of Upcountry Maui – including Makawao, Pukalani and Kula – where approximately 5,492 customers are without power; as well Pā‘ia and Ha‘ikū, where 2,727 customers are still affected when high winds brought down lines and cut power to these areas. In East Maui, about 199 customers are without power. On Moloka‘i, crews are working to restore service to approximately 100 customers in the East End. Maui Electric reminds customers to stay away from downed power lines. Assume they are energized, or “live,” and dangerous. If you see someone injured after touching a downed power line, call 9-1-1 for help. Warn others to stay clear.